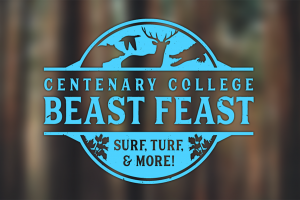 SHREVEPORT, LA — The Centenary Alumni Association hosts “Beast Feast 2018: Surf, Turf, and More!” on Saturday, May 19 from 4:00 to 7:00 p.m. on Centenary’s Jones Rice Field. The second annual Beast Feast is a unique, festival style culinary event featuring wild game, seafood, and other “off the menu” items prepared by local backyard chefs and popular restaurateurs. Louisiana Lt. Governor Billy Nungesser will be in attendance as the guest presenter for the “Best of Beast Feast” award. The event is presented by title sponsor Regions Bank and all proceeds benefit the Centenary Fund for Student Scholarships. Beast Feast attendees can expect to sample duck tacos, venison chili, a North Carolina pig pickin’ (courtesy of Centenary President Dr. Christopher Holoman), ceviche todos santos, szechuan duck and lop cheung gumbo, vegan BBQ and potato salad, and more while enjoying live music provided by local band Shayliff. A full list of chefs and cook teams is available at centenary.edu/beastfeast. The Office of the Lt. Governor and the Louisiana Seafood Promotion and Marketing Board is providing a generous donation of Louisiana seafood which includes 500 lbs. of crawfish, 500 lbs. of Louisiana gulf shrimp, and 100 lbs. of catfish, all to be prepared by area restaurants and backyard chefs. Other major sponsors for the event include VIP Tent Sponsor, SWEPCO, Stage Sponsor, National Management Resources, Site Set Up Sponsor, Majestic Tent & Event, Tray Sponsor, BRF, Media Sponsors, Townsquare and KTBS, and Beverage Sponsor, Eagle Distributing. Individual tickets for Beast Feast are $25 in advance and $40 at the door. Advance tickets are available at centenary.edu/beastfeast. All tickets include sample-sized food portions from all vendors, unlimited soda and bottled water, and a commemorative koozie and 16oz plastic cup. Premium craft beer will also be available for purchase. Children 12 and under are free and can enjoy games and activities in the Cosse Silmon Kid Zone. For more information, contact Saige Solomon, Director of Alumni & Family Relations at Centenary, at ssolomon@centenary.edu or 318.869.5115.